The above picture is from the first MARCI image taken in orbit around Mars during an instrument check-out in March 2006. 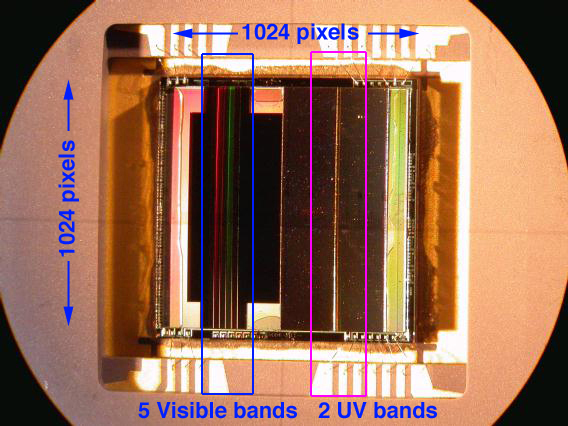 Because of the low signal levels in the ultraviolet (UV), the two UV channels are exposed independently of the five visible/near-IR channels, are summed 8x8, and are processed separately. The UV images are not shown in the examples on this page. These bands are curved because the MARCI uses an extremely wide (180°) angle ("fisheye") lens that greatly distorts what it is viewing. In the normal mapping orbit that will begin when the MRO spacecraft completes aerobraking in the later in 2006, a frame is taken when the spacecraft has moved far enough along its orbit so the scene has moved by about the height of one filter strip; this takes about 3.2 seconds. For the post Mars Orbit Insertion image, shown here, MARCI was also taking a frame at this rate, but the motion was much slower, especially at the start of the image sequence. This allows us to make a 15.6 MByte animated GIF movie of the planet as MRO moved southward. To view this movie, it is best to download it so that the file is local on your computer. Be patient while watching it, because at first it appears nothing is happening and that it is a still image. But slowly, you'll notice the planet is getting bigger and that craters are moving from one band to the next. During this sequence, the spacecraft was moving south towards the bottom of the image, and the sun was to the right, with the morning terminator (the sunrise line) near the center of the image. The time of day is just before 8 AM Local Solar Time. To make color maps from these frames, more processing is required. First, each individual 16-pixel-high strip of the frame looking through a specific filter (which we call a "framelet") is extracted and map-projected. In the figure below, we have separated the images so you can see them as individual framelets, in reality, they overlap. We can then take the maps for three different colors and construct a color mosaic. Below we show bands 1 (425 nm, blue), 2 (550 nm, green), and 4 (650 nm, red). 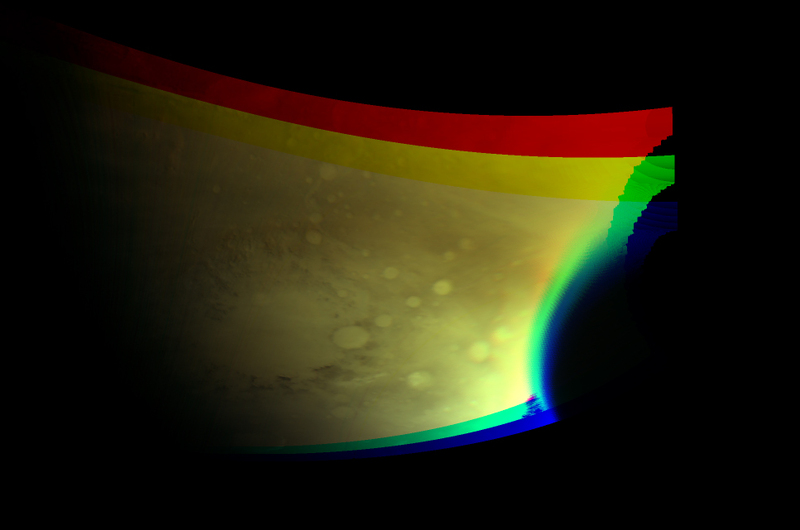 Note that these images have not yet been calibrated for "true color" (for example, the green channel is proportionally more sensitive and brighter than the red and blue channels), and residual errors in the geometric mapping of the MARCI fisheye lens result in slight feature mismatches, especially near the limb of the planet (the edge between the bright planet and dark space). Malin Space Science Systems built and operates the MARCI onboard MRO at its facilities in San Diego, California. The Jet Propulsion Laboratory operates the Mars Reconnaissance Orbiter spacecraft with its industrial partner, Lockheed Martin Astronautics, from facilities in Pasadena, California and Denver, Colorado.